Okay, this is a little belated, but I doubt that I will ever get an opportunity to review them in my office, so I wanted to mention them here. 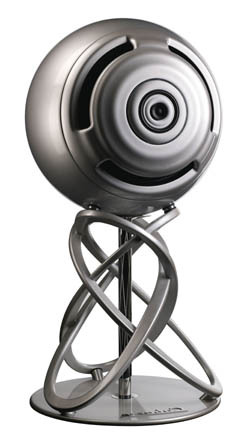 I’m talking about the Cabasse La Sphere speaker system. Last Thursday the new Australian distributor, International Dynamics, flew me and several others in this field down to Melbourne to formally announce the distributorship, and to demonstrate Cabasse’s flagship loudspeaker. Flagship in this context means, amongst other things, expensive. The stereo pair cost $199,000. Yes, nearly two hundred thousand dollars. For that you get the two loudspeakers with their stands, an active crossover unit, and the attendance from France (Cabasse is French) of Christoph Cabasse, the son of the founder, who will install and align the speaker system for you. In addition to a suitable source device, you will also need to come up with eight power amplifiers (you can purchase Cabasse’s set for $39,999 — these are good for a total of 5,200 watts of ICEpower). One of the speakers is pictured to the left. Each stands 1,400mm tall. The active part is a 700mm sphere. They are four way speakers, coaxially located. The bass driver are 550mm in diameter (22 inches). Cabasse claims very high sensitivity for the four drivers: 93dB (for 2.83 volts input at one metre) for the tweeter and upper midrange, 94dB for the lower midrange and 96dB for the bass driver. Because each has its own amplifier, the different sensitivities don’t matter. What does matter is that they are all very high. But can you trust a company claim like this? As it happens, late last year I reviewed a Cabasse sub-sat system. The Eole2 has little spheres — each with a tweeter/midrange coaxial assembly — and a subwoofer. Cabasse claimed the ludicrous sensitivity of 91dB. This from spheres only 130mm in diameter with no bass reflex port. The norm for satellites of this size is 86 or 87dB. I measured 90.5dB in my room using bandwidth limited (500-2,000 hertz) pink noise. So in Melbourne we listened to the La Sphere speakers in a very large room. They played a superb drum piece that turned out to be an intro for yet another version of ‘Take Five’. The precision of the drums — stereo imaging and control — was incredible. A female vocal on the next track sounded odd, but only because the speakers instantly revealed the artificial reverb that had been added to her voice in the recording. Then there was a segment of the Schtschedrin ballet version of Bizet’s Carmen. This has an enormous amount of percussion going on and is extraordinarily dynamic. My grandmother gave me a copy of this on vinyl when I was a teenager. I’ve since purchased a CD of the same version, which was from the Bolshoi Theatre Orchestra, and it is a very poor recording indeed, primarily due to harshness, but also somewhat dynamic and exciting. Later I purchased an EMI recording which was curiously flat and uninvolving. I now have on order the Chandos recording used at this demo. My goodness, it was simply great. When you know a piece of music like this, and you know that a segment of the music ends with a crescendo of noise from everything in a percussion-heavy full orchestra, sub-consciously you anticipate that it will be restrained, or, rather, constrained … by the system. It will be like those vocalists who insist on moving the damned microphone away from their mouths when they hit a big note. The urgency of the moment is delivered, but at a lower volume than it ought to be. Well with these speakers there was none of that. None. They hit the power burst and delivered cleanly, with the full frequency spectrum, and with immaculate control. We listened to more, but that did it for me. Were I a multi-millionaire, I don’t think I’d even bother auditioning anything else. Hey, you’ve hit the ‘Read More’ button, which means that you now have the opportunity to win Lord of the Rings: The Return of the King on Blu-ray. Same quality as a bought one, this test disc lacks a nice label, box or slick. Just ask for it in comments. Australian mailing addresses only, thanks. This entry was posted in Audio, Equipment, Giveaway. Bookmark the permalink. Finally some odd looking hifi gear that actually lives up to the manufacturers hype. I wonder, do you have to get Christoph back every time you move the speakers when doing the vacuuming? The baltics are almost a work of art ! Lovely sound very encompassing, the bass was solid deep pretty full. A tad over done, but I’d say that’s just setup. Listened to a good cross section of music, including hugh maskelas stimela coal train. Lovely stuff ! Was best track listened to. The expansive sound a stand out. If I were looking for a speaker for a penthouse suite, beachside house with expanses of space the literal eye balls on a stick the baltics are couldn’t think of a better choice. Theyd have huge waf too i reckon. In sound they were in league of b&w 802d or focal utopia divas id say. with one big advantage of the separate subs, taking them deeper lower than those speakers and the bonus of adjustability to suit. In design first thing it tells you who needs some big huge ugly monoliths for good audio. The spheres wow I don’t think words can describe in looks they’re quite amazing things. In sound straightaway you get the impression of just such a clean sound. Like some great speakers I guess never put a foot wrong ! Can I apply for the free disks please? regards Ross Shepherd, 230 Morack Rd. Vermont South 3133 Victoria. Loved that night and what special speakers they are indeed. Hi Stephen, i’m making the blind assumption the two fellas above already own Lord of the Rings. I don’t. If they don’t claim, i would like to add to my b-ray mix. Now all i need is the $$ for a 7.1 Cabasse set- up. How good would that be? Hi Anthony – sorry, Ross beat you by 50 minutes. He is a first-time commenter, so his comment was held for moderation. Ross, I’ll slip the disc (singular) in the mail. Mark, I asked about what happens if you move. You can indeed get him back out … but it’ll cost. alebonau, thanks for the thoughtful comments. I was of two minds whether the La Sphere bass was a trifle more forward than normal. But it was so clean an extended, it was hard to tell.